If you suspect that you have a bird infestation on your property, you might be anxious to understand the damage that they can cause and how you might prevent it. Bird and pigeon netting is one highly successful method of preventing damage to your property that also offers a discreet and reliable way of actually keeping birds away. If you have noticed any of the classic bird infestation signs such as; numbers of birds sitting on roofs or ledges, continuous bird noises, nesting debris around your property, excessive bird droppings or feathers littered around, give us a call and we can discuss methods of bird proofing with you. Although birds are wonderful creatures that can cause delight by their presence, their presence in numbers can be irritating and can cause huge problems. Bird faeces, for instance can cause health issues such as histoplasmosis and cryptococcosis, you certainly don’t want to risk being exposed to faeces through there being an out of control number of birds on your property. Bird droppings can also cause damage to your property as well as looking unsightly. If the problems associated with their faeces isn’t enough there is also the fact that birds nesting on your property can also lead to an insect infestation as bugs are often attracted to nest and roosting sites. You might also need to consider the issue of aggressiveness from birds, particularly if they are nesting on your property as they may attack in order to protect their young. You may also have fruit or vegetables growing in your garden that you want to save for your own consumption, rather than being a food source for the local birds. Bird netting is an extremely reliable method of bird proofing your property without harming any birds. Bird netting is made of nylon and is fixed to a pre-tensioned wire rope frame. This creates a strong net that is virtually impenetrable to birds and pigeons. They are also difficult for birds to land or perch on, giving you the option to protect any parts of your property that you deem necessary from the risks associated with birds congregating. In essence, bird nets stop birds from entering any areas that you do not want them to be. When considering bird control you might be concerned about protecting the aesthetics of your property, as we often think of barriers and netting as being ugly. 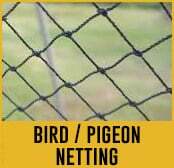 With bird and pigeon netting, however, you can maintain the appearance of your property as the nets are extremely discreet, indeed they cannot be seen at all from a distance. The nets, themselves will also retain their good appearance as the components and fittings are made from stainless steel, which is guaranteed to remain looking good for a long time. Bird netting is also a very affordable method of protecting your property from congregating birds. The nets themselves are very reasonably priced and once they are installed require no further investment. They do not require a power source, there are no electricity costs to take into consideration. The nets simply do the job of keeping birds away from your property by being there. Netting can also protect hard to reach places such as alcoves, balconies or recesses. Indeed, these places can be very difficult to protect using other methods. Bird netting is also very successful when used on a variety of public buildings, such as stadiums, bridges or underpasses, protecting both the building and the public from the danger that can be posed from excessive numbers of birds. If you do have a bird control problem, it is important that you contact the experts. Not only can we offer advice in regard to how to humanely deal with bird proofing and how to install bird control netting efficiently, but we can also ensure that you do not break any laws in regard to harming birds, who are often protected by legislation. We are experts in installing bird and pigeon netting and know where to place it so that it remains inconspicuous, retains the aesthetics of your property and has the maximum impact in protecting you from the damage that birds can cause. Give us a call today if you suspect that you have bird infestation problem and we can discuss your options.